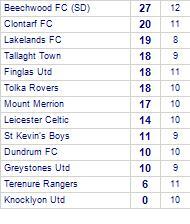 Lakelands FC have yet to win at home. Lakelands FC suffer defeat to Sheriff YC. Lakelands FC has yet to win in this competition, having lost all 6 games. Cabinteely FC are defeated by Lakelands FC. Lakelands FC suffer defeat to St Joseph's Boys. 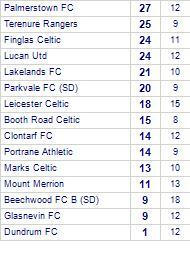 Lakelands FC has yet to win in this competition, having lost its last 2 games. 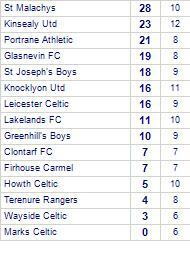 Lakelands FC share honours with Portrane Athletic. 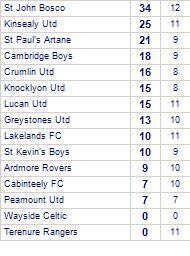 Lakelands FC has yet to be beaten in this competition, having won 3 out of its last 5 games. 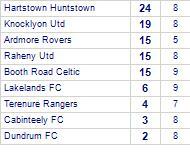 Lakelands FC has yet to be beaten in this competition, having won 4 out of its last 5 games. 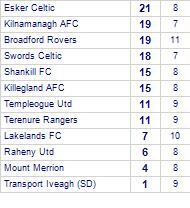 Lakelands FC beaten by Ardmore Rovers. 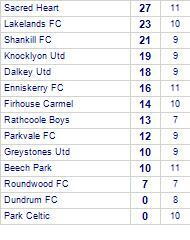 Lakelands FC are currently on a losing streak of 4 games. 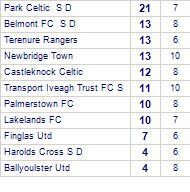 Terenure Rangers take all points from Lakelands FC. 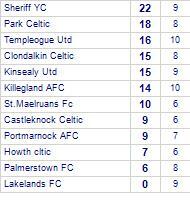 Lakelands FC take spoils against Dundrum FC. 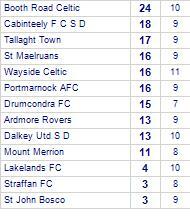 Dundrum FC has yet to win in this competition, having lost all 5 games.